Once again the wind was blowing like crazy so don't mind my extremely wind blown hair! And my cable sweater obsession continues... When I saw this in Gap last week I thought to myself the last thing that I need another cream color cable knit sweater. But then I looked at the price and I couldn't pass it up! And I love that it is a little different then my others because it is a poncho. Love that sweater!! Such a great find! That poncho is gorgeous!!! Cute outfit!!! Love this look! Hunters are the best! This looks is flawless. Love the pops of green. The sweater is gorgeous! I love the pops of green in the outfit! What a great outfit....I love the green on you! I'm so in love with your poncho, it looks super cozy and chic! I'm a huge fan of cable knit too, is just so cute! We've barely had any cold weather either! Hope yours lasts! You're always dress so adorably. I'm sure the cold weather is refreshing down in Florida. It's crazy how much warmer it is one state down from Georgia (its like 5 degrees here today). I'm heading back to Savannah next week and I'm hoping it's warmer than here! Your outfits are always perfect! 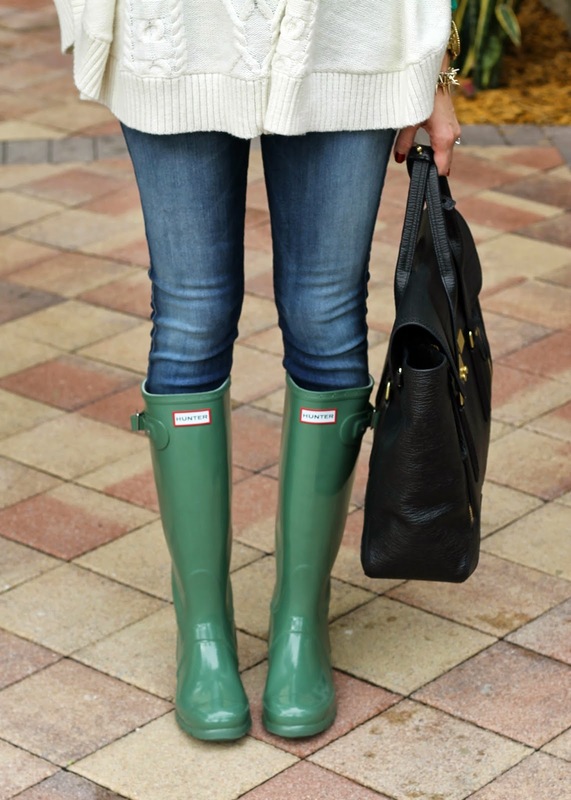 I love those green hunter boots, very pretty. I love it! You sound like me. I live in california and it's not getting cold! lol I'm crossing my fingers that it gets a little chillier. 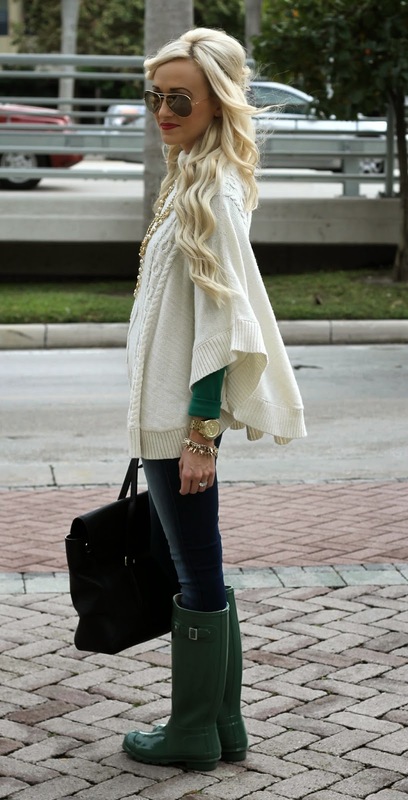 Love the poncho - i've really been into knits lately. 40 degrees?! I would give anything for that right now, hah! And are these Hunters new?! I've never seen that color before. Love them! 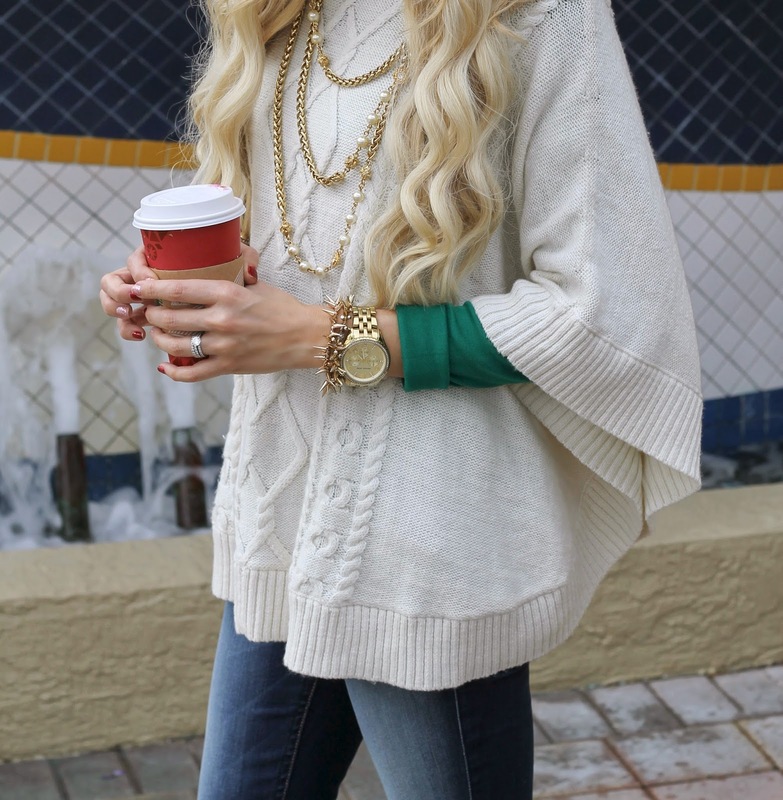 So crushing on this sweater! Looks so comfortable! I'm OBSESSED with this sweater!! I went into the Gap near me the day you posted this and couldn't find it. The hunt still continues!